There are very few things quite as annoying as machines that refuse to function like they're supposed to. Sometimes it can almost feel like they're doing it on purpose. For example: say you're running late one morning and your garage door suddenly decides it's taking the day off. Nope. Not opening today. Go ahead and take the bus, pal. More often than not, taking the bus is exactly what you'll end up doing, if not for the sake of simply cutting your losses short. After all, the last thing you want to do is waste more time pleading with the stubborn thing. So why do garage doors start "acting up"? The reasons for a malfunction can be numerous. Sometimes an outside factor can be involved, such as rough weather conditions or an unintentional collision with an entering vehicle. However, the most common culprit is usually a familiar one – old father time. The older a garage door gets the more wear and tear it must've suffered through, and since gradual degradation is as relentlesss relentless as the tide, many related "injuries" often become unavoidable. You might find yourself morosely pondering: if my door doesn't open and close as smoothly as it should when I WANT it to, how can I trust it to function properly when I NEED it to? Well… you can't. It'll take you no time to arrive at this conclusion. That's why you'll need to trust someone to either coheres your door into action whenever it misbehaves, or to have someone introduce you to a more agreeable model. 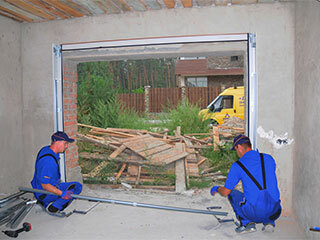 Whether it's springs, rails or a faulty opener, our team of Buffalo, MN based experts are beyond proficient in handling every type of garage door related issue. We also provide our customers with a preemptive maintenance routine that helps homeowners avoid potential mishaps. For any garage door related concern, don't hesitate to reach out to us!